Chilli Chocolate Sauce, Mole Poblano, Mexico in a jar! Info: Another of Chilli Pepper Pete's storecupboard essentials, and what a delicious one! Containing the Holy Trinity of Mexican chillies - Ancho, Mulato and Pasilla, along with the complex flavours of about 20 different spices all blended with smooth dark chocolate, this sauce lends a sweet-savoury note to any dish. Try it in a chicken, or duck, casserole, adding it at the stage where you would add cream. A little goes a long way and gives any dish a rich, velevety texture and incredible depth of flavour. 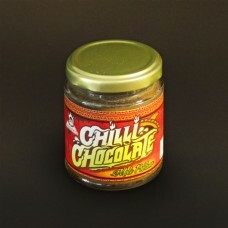 Suitable for vegetarians and vegans, this goes perfectly in a chile sin carne for example. And if you don't cook, just spread it on fresh bread or crunchy toast - so much better than Nutella!